"Sadly, the article is littered with inaccurate data, continued lies, and very sloppy reporting," says Risk & Policy Analyst, Ron Law. Bay of Plenty medical officer of health Phil Shoemack is reported as saying that there's no doubt the immunisation campaign has been effective and is quoted as saying, "The vaccine has accelerated the natural decrease in the epidemic. When you look at how much of an impact it's had, we wish we could have had it earlier so fewer kids would have got the disease." To back these statements the article declares: "In the two years before the vaccine became available in the Bay of Plenty, 107 cases were reported - 29 in 2004 and 78 in 2003. Two people died." Unfortunately the doctor and/or reporter transposed the years and data. 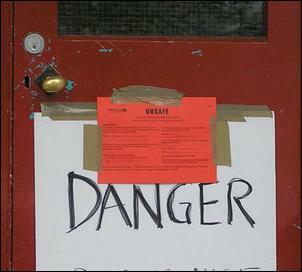 The Herald's data show that 78 people contracted the disease (with no mention of types) in 2003. 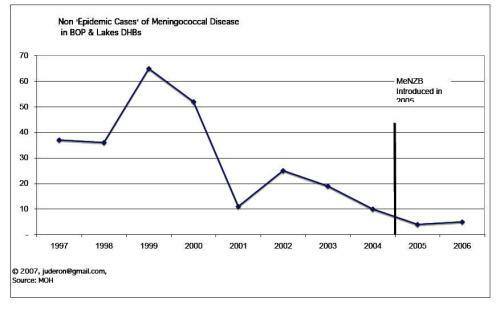 By 2004, BEFORE the vaccine was introduced the number had dropped dramatically to 29... a 63 percent decline in the year BEFORE the MeNZB vaccine was rolled out. 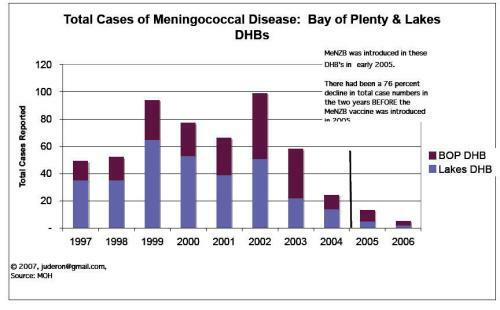 The Ministry of Health's own data for the Bay of Plenty and Lakes District DHB's reveal there had been declines of 81 percent in epidemic strain cases of meningococcal disease, and 76 percent of total cases from peak levels BEFORE the vaccine was introduced. 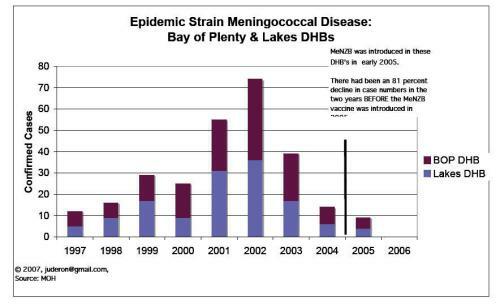 Claims that "The vaccine has accelerated the natural decrease in the epidemic," are simply a continuation of an ongoing litany of lies associated with the MeNZB vaccine. Find more from Ron Law on InfoPages.